March 15, 2014: As I walked towards the stage to receive the 'Award for Excellence in Social Service' on behalf of Friends of Tibet Foundation for the Wellbeing, from HE Shri MK Narayanan, Honorable Governor of West Bengal, India, I looked back upon the seasons of change in my life. During the initial months, since my office was near the camp venue, I would leave my parents at the camp and return later to pick them up. I observed something new  unlike the impatience they normally exhibited towards the wait at other hospitals, my parents enjoyed their time at the Wellbeing camp venue, talking to Volunteers and other 'participants' (not patients) of the programme. My father was very impressed with the accuracy of pulse diagnosis achieved with just a feel of the pulse on one's hand. The harmony and peace on the faces of Volunteers and participants surprised me. Curious to know more, I stayed back and spent more time at the camp, interacting with the Volunteers and slowly understanding the process and about Tibetan Medical System. It is imperative that I mention a bit about the Volunteers who conducted the camp. They were people from different walks of life, excelling in their chosen fields. Interacting with them gave me a larger picture of life and I understood there is more to life than the cubicles of one's office. I became more interested in Wellbeing Camps and the Movement. After three years of battle, my mother won over her pains and sufferings and slept peacefully on Monday, October 29, 2012. This brought the curtain down in our lives  pushing us into darkness and emptiness. In those three years, every moment of our waking life was spent in close proximity to her. Every decision  big or small, was made with her in mind. Suddenly we felt as if we had lost purpose in life and had to start afresh. I had two choices: Sit and brood over the memories, or do something that would make me re-live her memories. Poetry was an accident, I started writing down my feelings, my inner trembling echo. I wanted to do something. I started exploring life, enjoying the meaning of it, the beauty it brings. This led me to Volunteering for Wellbeing Camps. During one such visits there was a team of documentary filmmakers from Hungary and Philippines who were making a film on 'Sowa Rigpa, the 'Science of Healing'. They asked me to share my experience and I opened up. I wanted the world to know more about my mother and her life, her brave battle. Sharing one's experience is something people shy away from, but I believe it is the best tribute one can give to ourselves and our dear departed ones. It helps in building awareness. And awareness is the first step towards "Wellbeing". "Normally if you have some illness, if you take medicine you become better. But in case of Cancer, you take chemo or radiation, you become worse. So that's Irony"
At one of the camps, I was exposed to the beautifully etched book of poems "Kora" by Tenzin Tsundue, Friends of Tibet Campaigner. It was an inspiration. I was moved. I started reading more about the Tibetan movement for Independence. The feelings of a generation living in a land which is not theirs, and not allowed to enter a land which belongs to them. During one of my many memorable and cherished meetings with Shri Sethu Das, I informed him of my desire to do something for my Mother's first death anniversary. He encouraged me to publish a book of my poems. He said it would be the best tribute I could give her. 'Seasons', a tribute to my mother, and million others affected by Cancer, was released on October 29, 2013, on her first death anniversary. Around June 2013, I was introduced to one of the Wellbeing Participants, Shri P Sanjumon who ran a charitable institution named Daya. I was intrigued by his service and his personality. Sanjumon, spent most of his days earning a livelihood on the platforms of railway stations. He had seen the sufferings of socially neglected, mentally and physically challenged people who were disowned by their own families, and HIV infected people. 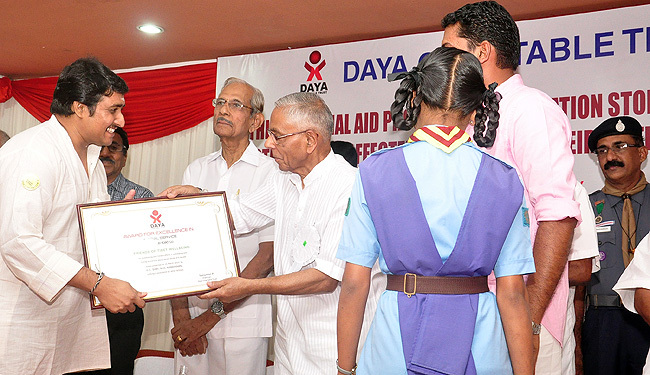 He decided to dedicate his life to their wellbeing and he formed the Daya Charitable Trust in 2007. Over a period of time Daya adopted over 150 HIV infected children and mothers. With a smile on my lips, proudly representing my Friends of Tibet family, I walked to receive the 'Award for Excellence in Social Service' at the hands of HE Shri MK Narayanan, Governor of West Bengal and former National Security Advisor  an honour for our outstanding and tireless efforts in addressing and raising awareness about social issues and causes at an event organised by Daya Charitable Trust.